We’re just a week or so away from back to school here in Ontario, and that means that families are kicking into plan and prep mode. Before you get lost in a sea of new backpacks, lunchboxes, and pencil cases, have you put much thought into back to school snacks? Lunches are important, but snacks, those mini meals that sustain us from one meal to the next, are often an afterthought. Before you head to Costco to buy the bulk box of whatever granola bar they happen to have on sale, I want you to think about what the real purpose of a snack is. Besides keeping tummies from grumbling before it’s time for the next meal, they help to regulate blood sugar levels (something that isn’t easy to do if a snack is full of sugar), which in turn aids in concentration, and keeps moods stable. If blood sugar levels go on a roller coaster ride throughout the day that can lead to irritability and inability to stay focused. In a classroom setting that can have a huge impact on not only learning, but also the general dynamic of the class as a whole if a teacher is dealing with a room full of unruly kids. Snacks should be low in sugar, and have a mix of protein, carbohydrates, and a little fat to help fill a kiddo up, sustain them, prevent a massive spike in blood sugar levels, and give their brain energy to keep learning. They should not contain refined sugar, refined flour, or any other fillers, artificial flavours, or colours. 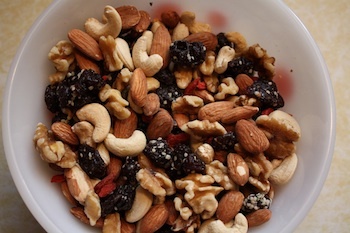 Healthier snacks like this take planning and a little preparation, but usually make enough to keep around for a week or so. -smoothies, which can also be turned into healthy popsicles for after school snacking! I encourage you to make as many of your snacks at home as you can, because you might be surprised by the amount of sugar hiding out in some common store-bought snack items. Convenience often comes at a cost. And don’t forget to have healthy snacks on hand for after school! Unless you plan on feeding your kids dinner at 4pm, they’re going to need fuel to get them through any after school activities before dinner later on! A little preparation each week will go a long way and keeping kiddos from getting hungry means everyone will have an easier day.